Already started to search for fresh ideas of how to elevate your Halloween home decor this year? If you’ll be hosting a dinner, continue reading because we are going to feature some of the best Halloween decorations that will certainly make your home best decorated in whole town! And believe us, some of those Halloween decorations are so stylish, you’ll be tempted to keep these up long past October 31. Lets start with unique decorating ideas for your Halloween home decor suggested by unique mid-century lighting brand Delighfull. Seems thy´re preparing for the Halloween spooktacularly! Save these unique decorating ideas for later by pinning this image below and let´s continue with other decorating ideas. Add felt bats to a twig wreath to give trick-or-treaters a friendly fright. 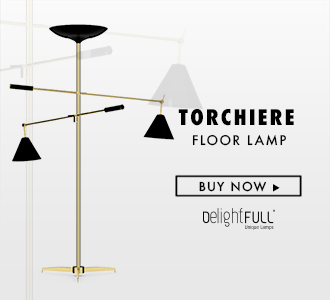 We had fall in love with flashy lamp form Delightfull´s Graphic Collection – its frighteningly dazzling. This is truly the ultimate craft supply of Halloween lights that will transform your hallway into the spookiest ever combined with a spider web on the floor. Spooky candles will add some black spice to your dining room lighting. A perfect way to brighten up your dinnertime. Decorate your mantel with old portraits, orange pumpkins, spooky candles – give it a mantel faux glow. The ultimate touch of this one is mid-century style Jackson Floor Lamp from Delightfull that embodies rhythm, exposed mechanical elements, and luxurious finishes, never forgetting the inspirations for the 80s. The perfect addition to your Halloween home decor. Choose wisely and this wicked decor element will become centerpiece of your Spooktacular Halloween Home Decor.